Swiss actor Pascal Ulli successfully adapts Jim Carroll's "The Basketball Diaries," bringing the author's tale of his misspent teen years to life on the stage. In this one-man show, accomplished Swiss actor Pascal Ulli portrays the young Jim Carroll during his days as a promising young teenage basketball player and scholarship student who becomes a heroin addict. As a book, "The Basketball Diaries" is an engrossing, colorful read as Carroll's flair for language blooms on every page. The film version of the book (starring Leonardo DiCaprio and released in 1995) was an anachronistic mess. 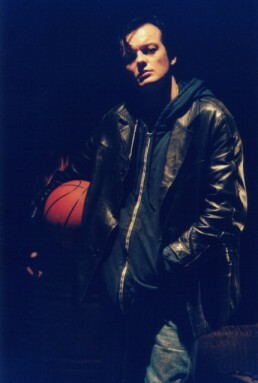 As crafted for the stage by Mr. Ulli, "The Basketball Diaries" is a vivid, gripping, long hard look at what happens when one becomes addicted to heroin. Ulli is very effective as the smacked-out Carroll; speaking in a dreamlike slur, his eyes rolling as his hair falls over his forehead. He also sweats like a junkie (though maybe that's just the air-conditioning situation in the theater). Ulli's Carroll comes across as hip and smart, streetwise beyond his years as he matter-of-factly describes his adventures hustling to get dope money. He paints detailed verbal pictures of getting high in parks and avoiding the cops. Ulli even cooks up something in a spoon, ties off his arm and prepares to inject himself when suddenly we hear a banging on the door and a booming voice announcing that the police are here. Ulli revels in some of the book's best stories � such as Jim and a drug buddy finding out that they just copped some Ovaltine and Jim's not-so-good acid trip where he goes to the Museum of Modern Art. Ulli is a very gifted actor and he takes command of the stage here. If you've read the book, you'll find that this production captures the vibrant flavor found on the page. If you haven't read it, Pascal Ulli's "The Basketball Diaries" may make you want to pick up a copy. I saw the show a few nights ago, and rarely have i observed a more self-involved, pointless actin exercise in all my life. The humor is beaten out of the piece, which is soulless, tedious and self-important in the extreme...I was not only dissapointed, I was vaguely horrified that narcissistic whining and meandering can get good and great reviews...this is a show that deserves to be buried and forgotten. It is a self-important dialog that Ulli is having with no one but himself--his language gap is the LEAST of the problems in the piece. I saw the show and I liked it, but I can understand that people don't want to see the fall of a junkie. But I want to ad a thing to Mike Daisey's comment: you're not a critic nor are you a regular audience, you're a fellow actor who also presents a solopiece at fringe, the least thing you could do is respect the work of other actors. Mike Daisey shame on you! "you're not a critic nor are you a regular audience, you're a fellow actor who also presents a solopiece at fringe, the least thing you could do is respect the work of other actors." This is patently inane. What is this, a Girl Scout troupe? I had no idea one has to register as a critic to speak their mind. Further, I'm not in a union--I don't suffer fools gladly, and if I can take the heat for saying something is very indulgent and bad and putting my name on it then so be it. The idea that I should be silent when I see crap happening is wrongheaded--what you are seeking is social politeness, which is sometimes appropriate but I was moved by a terrible, narcissistic performance and a review I felt does not reflect the reality of the piece I saw. I would be just as vocal if a fantastic piece received an atrocious review.